All published diagramatic evidence for the cervical (neck) vertebrae of Acrocanthosaurus are reproduced on this page, but with a twist; all images have been scaled. rotated, and reassembled to aid comparison. In addition, the images of Harris 1998 have been flipped horozontally to conform with other publications. The number of cervical vertebrae is unknown, but generally assumed to be nine in accord with similar theropods (although Harris 1998 reported there were 10). 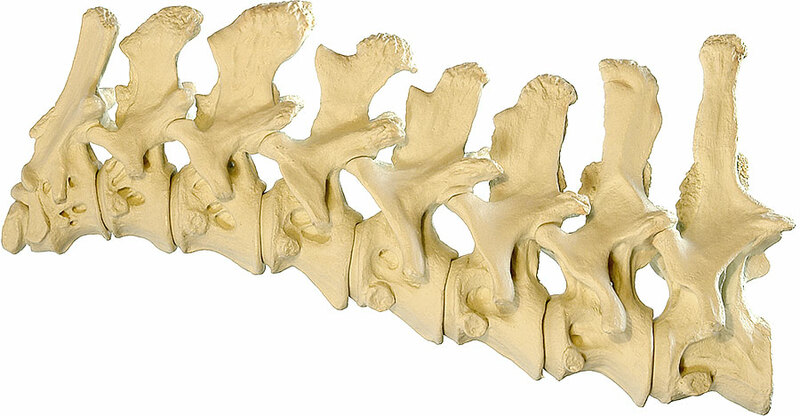 The blended morphology of the transitional vertebrae between cervicals and dorsals makes the absolute cutoff somewhat arbitrary. 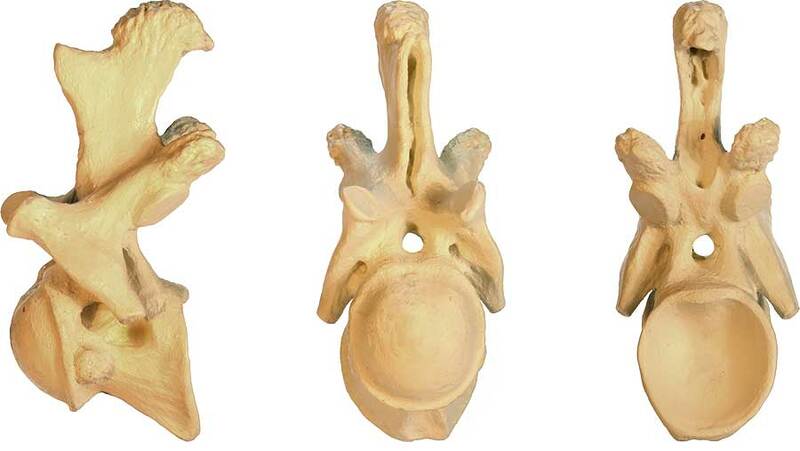 The main fossil evidence is provided by Harris 1998, however Stoval and Langston 1950 did recover and describe enough of the cervicals to produce the drawn articulation shown opposite. 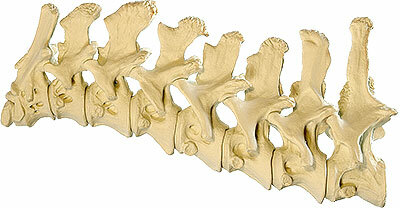 Their material for the seventh and eighth vertebrae is especially important. 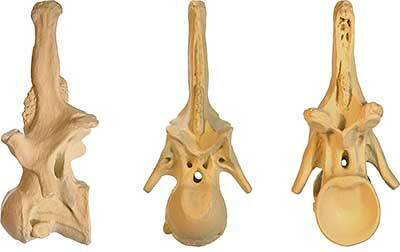 Currie and Carpenter 2000 did not describe any new cervical vertebrae from their fossil material. In addition to the published evidence and to aid comparison with the Stoval and Langston articulation, I created a virtual articulation from the drawings of Harris (shown below). 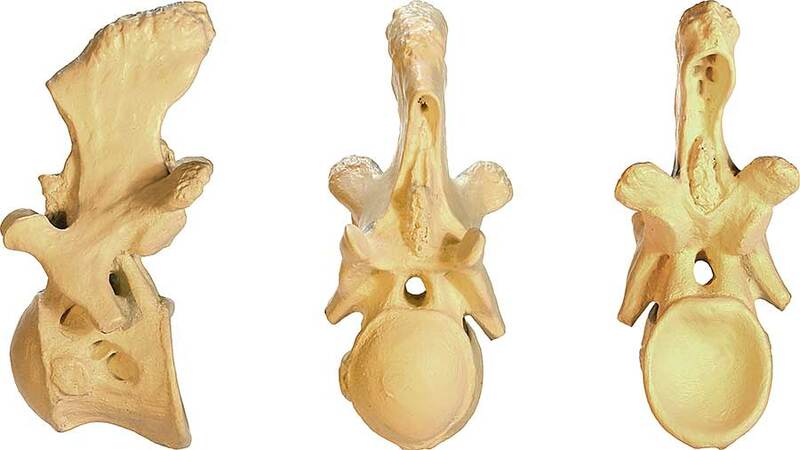 Both reconstructions are remarkably consistent considering the separate and fragmentary fossil evidence in each publication, although the dorsal spines of vertebrae five and six are much taller in the Stoval and Langston fossils. Given that the bones are so ornate and rugose (having areas of roughness), there was no doubt a great deal of variation between individual animals. Stoval and Langston 1950 Fig 3 (p 706): cervicals 3 to 9 + dorsal 1. 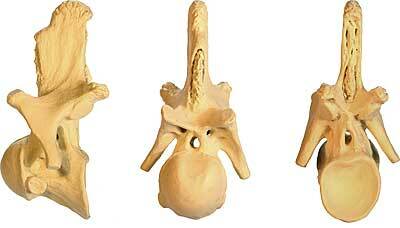 "Only cervicals 8 and 9 and dorsal 1 were articulated. All bones are slightly distorted and damaged by tree roots and ground acids, but they are sufficiently well preserved to permit the accompanying restoration" (above). Above: BrantWorks one tenth scale model articulation of the Acrocanthosaurus atokensis cervical vertebrae one to nine. 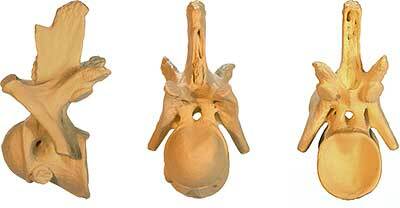 Views: (A) lateral, (B) dorsal, (C) ventral. 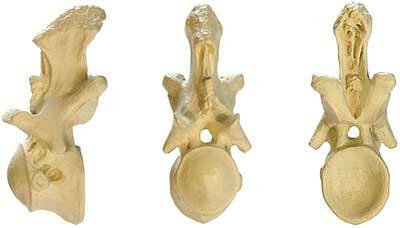 Reconstruction of articulated cervical vertebrae 2 to 9 from the evidence of Harris 1998. scale bars are 10 cm. 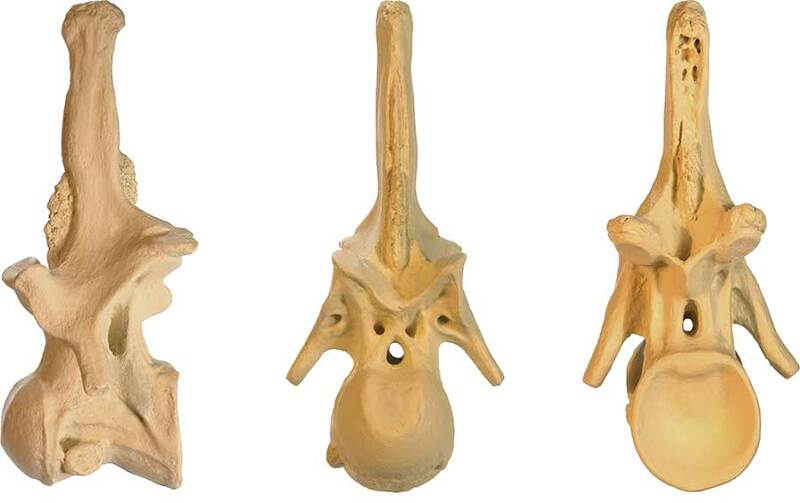 Positions are in approximate alignment with the articulation of Stoval and Langston 1950 (above), which, it must be noted, includes an extra vertebrae (dorsal 1). An Acrocanthosaurus atlas (CV1) has not yet been discovered. I used the Ceratosaurus atlas shown opposite as a guide to build the model above. Images modified from Madsen and Welles (2000) Ceratosaurus (Dinosauria, Theropoda) A Revised Osteology (Miscellaneous Publication 00-2, Utah Geological Survey, A Division Of Utah Department Of Natural Resources). Views: (A) cranial, (B) caudal, (C) lateral. Inset: Ceratosaurus cervical vertebrae 1 (isolated), 2 & 3 (articulated). Images modified from Harris 1998 Fig 10: Axis (CV2) of Acrocanthosaurus SMU 74646 3B-1 in (A) lateral, (B) cranial, (C) caudal, (D) dorsal, and (E) ventral views. Cross hatching represents matrix. Scale bar = 10 cm. Images modified from Harris 1998 Fig 11: CV3 of Acrocanthosaurus SMU 74646 3-45 in (A) lateral, (B) cranial, and (C) caudal views. Scale bar = 10 cm. Cross hatching represents matrix. Images modified from Harris 1998 Fig 11: CV4 of Acrocanthosaurus SMU 74646 3-51 in (A) lateral, (B) cranial, and (C) caudal views. Scale bar = 10 cm. Cross hatching represents matrix. Images modified from Harris 1998 Fig 11: CV4 of Acrocanthosaurus SMU 74646 3-54 in (A) lateral, (B) cranial, and (C) caudal views. Scale bar = 10 cm. Cross hatching represents matrix. Images modified from Harris 1998 Fig 11: CV4 of Acrocanthosaurus SMU 74646 3-66 in (A) lateral, (B) cranial, and (C) caudal views. Scale bar = 10 cm. Cross hatching represents matrix. Images modified from Harris 1998 Fig 11: CV7 of Acrocanthosaurus SMU 74646 3-59 in (A) lateral, (B) cranial, and (C) caudal views. Scale bar = 10 cm. Cross hatching represents matrix. 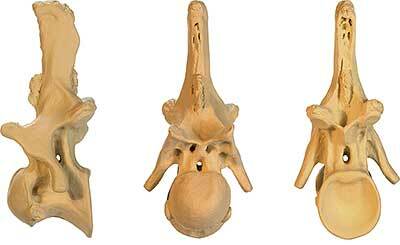 CV8 of Acrocanthosaurus SMU 74646 in (A) lateral, (B) cranial, (C) caudal and (D) cranial views. Scale bar = 10 cm. Cross hatching represents matrix. 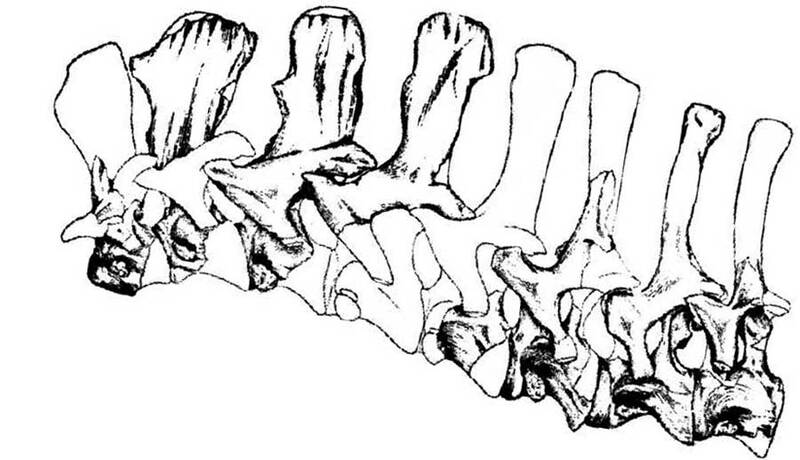 Grey detail is of adhered fragment presumed to be part of the dorsal spine of CV9. Images modified from Harris 1998 Fig 14. Right figure (E) is a lateral view of CV8 modified from Stoval and Langston 1970 Fig 3. Lateral view taken from larger articulation drawing (see above). Missing parts in white by the authors and I added undrawn area in grey. 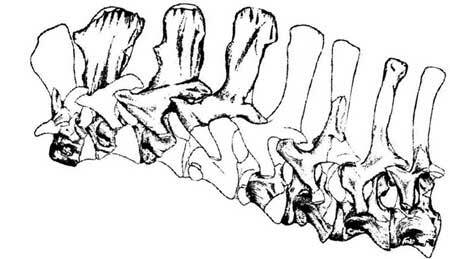 Fragment presumed to be part of the dorsal spine of CV9 of Acrocanthosaurus SMU 74646 adhered to the remains of CV8 (grey). Views shown are in relation to CV8; (A) lateral, (B) cranial, (C) caudal ,and (D) cranial views. Scale bar = 10 cm. Cross hatching represents matrix. Images modified from Harris 1998 Fig 14. Right figure (E) is a lateral view of CV9 modified from Stoval and Langston 1970 Fig 3. Lateral view taken from larger articulation drawing (see above). Missing parts in white by the authors and I added undrawn area in grey.